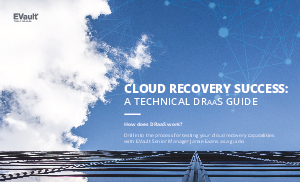 No one ever wants a recovery to go south—whether it’s your first or 50th time completing a data recovery operation. But your organization will experience a bit more anxiety when it goes to perform its first recovery using a new solution. If the phrase “successful recovery”, in your experience, has applied to only a few applications or a limited set of files, it’s understandable that you may be anxious the first time you test a recovery of your entire environment. Know this: you can successfully conduct a full recovery of your environment the first time as well as every time thereafter. This is the challenge and opportunity that I face every day in my role: to deliver successful cloud recovery for my clients no matter what. While we never guarantee that a recovery will occur without some hiccups during the process, I can point to the fact that every cloud recovery that I have overseen has met our agreed upon service levels whether that guarantee is for a 1-hour recovery, a 24-hour recovery, or some combination of all three.